Press Release (ePRNews.com) - NEW YORK - Jun 22, 2017 - The real estate industry is starting to grow once again, allowing opportunities for individuals to start a new, lucrative career in real estate. But, in today’s world, many people worry that they may not have the time to be able to put into getting their real estate license. 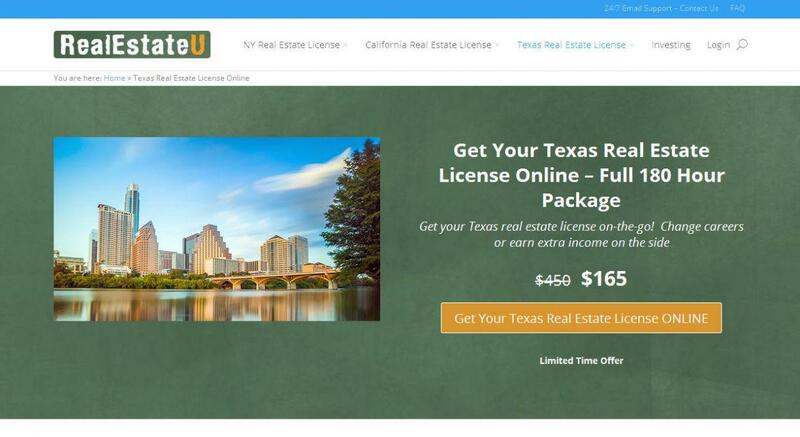 That’s why RealEstateU is offering classes through their website to allow students to obtain a real estate license online in Texas. At RealEstateU, they have developed a number of courses in order to allow students to have flexibility and ease in choosing schedules and classes so that they can continue their current career with as little interruption and stress as possible. Their online course modules are simple and intuitive, allowing students to customize their schedules so that they can make their transition into the real estate industry simpler than it would be otherwise. Real estate professionals, or entrepreneurs starting out in the industry, who are looking for more information about RealEstateU and the courses they have for obtaining a real estate license online in Texas, or who would like to talk to a representative that can address concerns and questions, should first take a look at their dedicated page, found at http://realestateu.tv/texas-real-estate-license-online/. Their contact page has all of the information necessary so that students, press, and other personnel can get in touch with appropriate representatives. RealEstateU offers opportunities for students to get a real estate license in Texas and several other states. They have been helping students with online course loads since 2013. Andrew Anic and Ciprian Morariu put together a full online video library, allowing students to have a practical and useful way to get the resources that they need to obtain real estate licenses. More information can be found at the website linked above.